Specifically, do the sort of metal devices that Europeans tend to screw to their walls and run hot water through in order to heat their houses radiate much heat, as opposed to transferring it to the room by convection and conduction? Similarly, what proportion of the heat emitted by underfloor heating is in the form of thermal radiation? Of course they radiate some heat. However, it's commonly said that they work mostly by convection and conduction. I think that's right and it's quite reasonable to call them convectors for this reason. Unfortunately, some people get a bit carried away with this and say that radiation is completely negligible. I don't think that's quite so right. where p is the power emitted in watts/square metre, ε is the emissivity of the surface (typically about 0.9 for common not-too-shiny surfaces), σ is the Stefan-Boltzmann constant, about 56.7×10⁻⁹ W/(m²·K⁴) and T is the absolute temperature of the surface in kelvins. When you've got two opaque surfaces facing each other with little else visible, say a radiator and the inside of the room around it, then they'll each radiate to the other resulting in a net transfer of heat in one direction. If they have different emissivities then things get a bit more complicated as the emissivity is also equal to the absorptivity (via one of Kirchhoff's laws) and the result will be some radiation being reflected back. 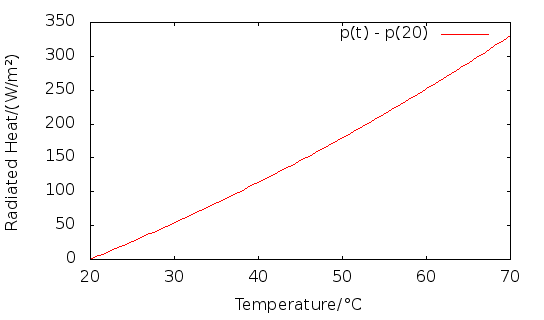 where T₁ and T₂ are the absolute temperatures of the two surfaces. The problems arise when people fixate on those T⁴ terms and conclude that either as the temperature difference increases by only a small amount the transfer will increase enormously (so global warming can't be happening) or, conversely, since radiative heat transfer at high temperature differences isn't all that huge it must be nearly zero at low temperatures (like with underfloor heating). Actually, the T⁴ effect is a bit less powerful than these people likely think, mainly because these are absolute temperatures so the proportional difference between two temperatures is not that great. I'm sure those who are distracted by this exponent know the following contrast is an extreme way of putting it but perhaps they don't appreciate by how much. ((273.15 + 70)/(273.15 + 20))⁴ ≅ 1.88. A factor of about 80 difference is not entirely inconsequential. 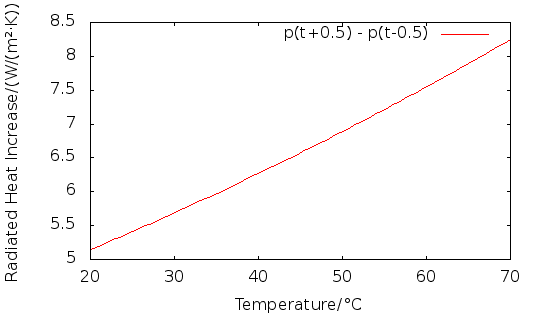 As the temperature of the radiator increases from 20 °C to 70 °C the heat radiation to the room increases (of course) and the rate it increases increases, a bit; the curve is not quite linear. Still, it's hardly shooting off to infinity and beyond. This shows that when the radiator is at around room temperature an increase from 20 °C to 21 °C will result in an increase of just over 5 W/m² in heat radiation whereas going from 69 °C to 70 °C will result in an increase of just over 8 W/m². More, but not hugely so. Right, so we've established how much heat is getting radiated away from these things. How does that compare with convection and conduction? Underfloor heating (UFH) is the easier case so we'll look at that first. As I've previously discussed, there are standard values for thermal resistances across surface/air boundaries in various orientations and for different air speeds. For UFH, the applicable value is indoor upwards, of course, for which both standards referenced give a resistance of 0.1 m²·K/W so a conductance of 10 W/m²·K. This compares well with other sources which give heat outputs from UFH of about 10 or 11 W/m²·K though a few give somewhat different values. If, as shown above, the radiative heat flow at UFH-level temperatures is about 5 W/m²·K then the other 5 W/m²·K must be convection and conduction; the two main methods of heat transfer are about equally important. In principle we could do the same sort of comparison for a radiator hanging on the wall. However, with the high temperature differences it seems likely that the published surface/air resistances are not directly relevant because of increased convection and the effects of turbulence, etc. where A is the area of the radiator exposed to the room. So, for a single element radiator between a fifth and a sixth of the output is by radiation. Given that such a radiator has two sides to do convection/conduction but only one to do radiation it would be quite reasonable to expect the proportion of output by radiation to be of the order of half of that of UFH, ie, a quarter of the energy going by radiation. As a vertical surface would also be more efficient at convection it's broadly consistent that the actual proportion would be lower still. As the radiator would also be radiating similar amounts of heat in the opposite direction - towards the wall it's mounted on - my feeling is that the Wikipedia article Radiator reflector is currently misguided in saying that there is little advantage to fitting a literal reflector behind the radiator. I'd like to see somebody do some experiments, taking care to select a material which is actually reflective at thermal infrared wavelengths, measuring the temperature in the wall behind the reflector. I'd be very surprised if using a good thermal IR reflector doesn't reduce that temperature quite significantly. Where the radiator has more than a single element or has extra fins and so on the convection and conduction will form a larger proportion still of the output. It seems that radiation is a significant proportion of the output of underfloor heating and a small but not negligible proportion of the output of more traditional radiators.